Renee Cesario met Brendan Kelly just two hours before country music star Jason Aldean took the stage at the Route 91 Harvest festival in Las Vegas Sunday. She had no idea that unexpected meeting may have saved her life. Renee invited Brendan to attend the concert with her and her friends, who all traveled from Riverside County, California, for the weekend music festival. As Aldean was finishing up his set, the pair moved closer to the stage. They had just started to dance when they heard what sounded like fireworks. While shielding Renee from the gunfire, Brendan, a 21-year-old U.S. Marine, assesed the situation. Within minutes, the shooting seemed to pause. “We have to get out of here. We can’t stay here. It’s not safe,” he yelled to 23-year-old Renee, lending a hand to get her back on her feet. The pair ran for safety — with Brendan leading the way. Jenn’s family were not able to check on her safety because she had lost her cell phone in the melee. They were greatly relieved when they heard her voice calling them from Brendan’s borrowed phone. 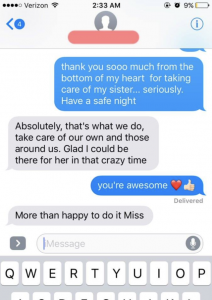 Below is a screenshot from Renee’s thankful sister Jenn to Brendan. Thanks to Brendan, Jenn says her sister is home safe and resting. “Her legs and arms are pretty beat up, but she is alive,” Jenn said. CBS says Brendan has not yet responded to news requests for comment, but close friends of the Marine say they aren’t surprised by his quiet heroism. Previous articleSan Juan Mayor Cruz is Nasty! But check out what else she’s wearing during Trump’s visit!